Yesterday’s holiday means a short post today. So! I thought I would share my absolute most favorite literary find, ever. Thems who knows me can confirm – I am a yard sale fanatic. I spot a yard sale arrow, the car comes to a screeching halt, and I execute a tidy little 3-point turn in a cloud of road dust. Why? Because I find treasures like the one you see above. 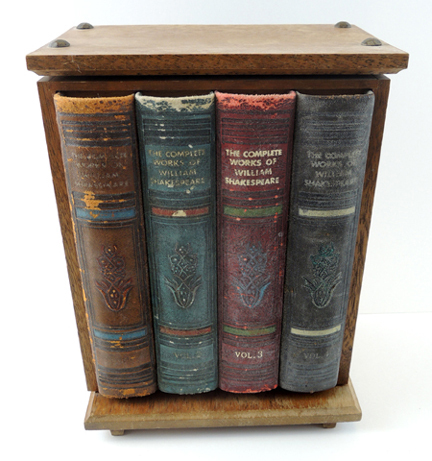 Yes, it may look like a four volume set of the “Complete Works of William Shakespeare,” but this is, in fact, a mini liquor cabinet, complete with a glass decanter for your brandy. HOW CRAZY COOL IS THAT??? I pounced on this many years ago. It cost me $5. 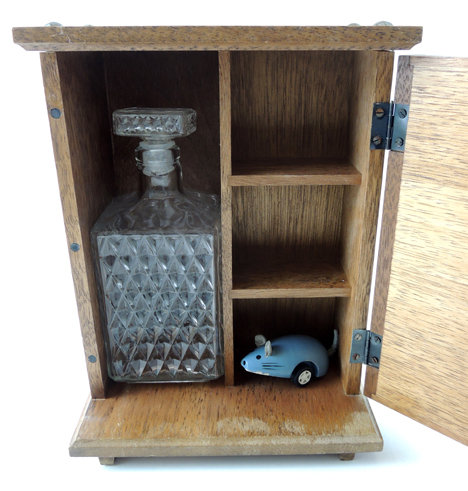 Alas, the shot glasses that accompanied the set were missing from the get go, but my little motorized mouse has found a comfortable home there. Note: I haven’t actually filled the bottle with brandy. Nor have I even tasted brandy (I know, right?). The running joke is that I’ll toast the publication of my first children’s novel with a big glassful of it. Someday…! This entry was posted in More Connections and tagged art, book, books, creative, favorite, find, hidden, library, literacy, rummage sale, shop, yard sale by Dana Sheridan. Bookmark the permalink.